Yet another last minute ingeniunity… LOL! I was inspired by a dish from Danielle of Mayple Syrup and Poutine made at our last cooking club meeting (the theme was Arabian Nights, hosted by Amarjot). Her contribution was a side dish made with roasted cherry tomatoes and Israeli couscous. I did not have any Israeli couscous handy, so I made my modified version with wholewheat couscous instead. This dish paired nicely with breaded chicken cutlets from Quorn to complete my semi-homemade dinner. Cook couscous according to package instructions using vegetable broth instead of water. Toss cut tomatoes and bell pepper with some olive oil, salt and pepper. Roast in the oven at 400F degree for about 20-30mins or until semi-charred. Stir the tomatoes and bell peppers once or twice while in the oven. 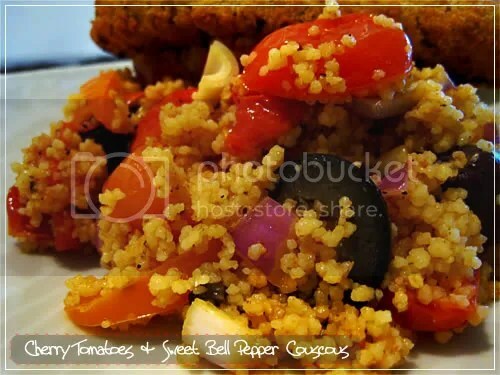 Once couscous, tomatoes and bell peppers are ready, toss all the remaining ingredients in a mixing bowl. Drizzle more olive oil if mixture is too dry. This entry was posted in Moroccan, Sides and Soups and tagged couscous, kalamata, Moroccan, trader joe's, vegetarian. Bookmark the permalink.